November 7, 2009 By Ethan Johns & filed under All Articles, Long Guns, Tactics/Training. Shooters work lateral shooting aggressively on Training Day 2. 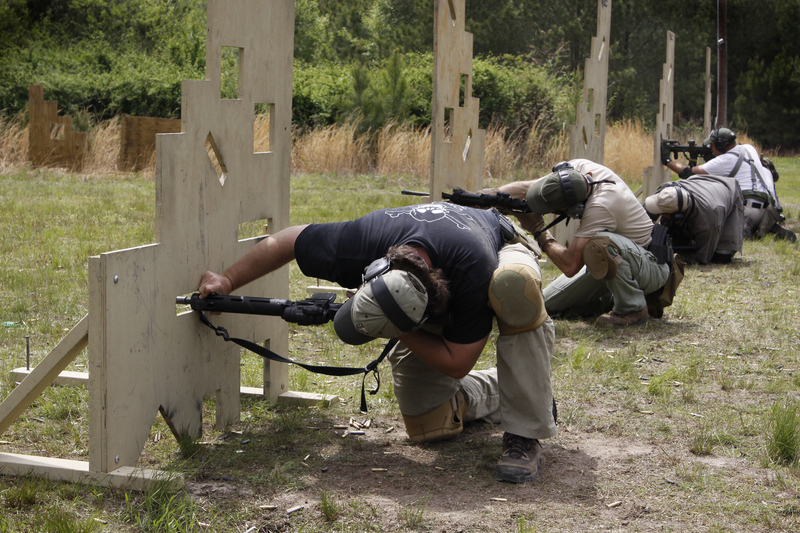 Viking Tactics is one of the foremost contract trainers used by elements of our country’s special operations forces. I had been aware of VTAC’s reputation for some time, but had not been able to match up a time against one of their few annual classes that are not exclusively contracted to SOF units. After reading VTAC owner/lead instructor Kyle Lamb’s Green Eyes & Black Rifles, and hearing yet more high praise from a trusted associate, I knew I had to get a VTAC class under my belt. Fortunately I was able to get into one of only six open enrollment classes offered this year. Viking Tactics encourages aggressive bladed fighting stance with the carbine. 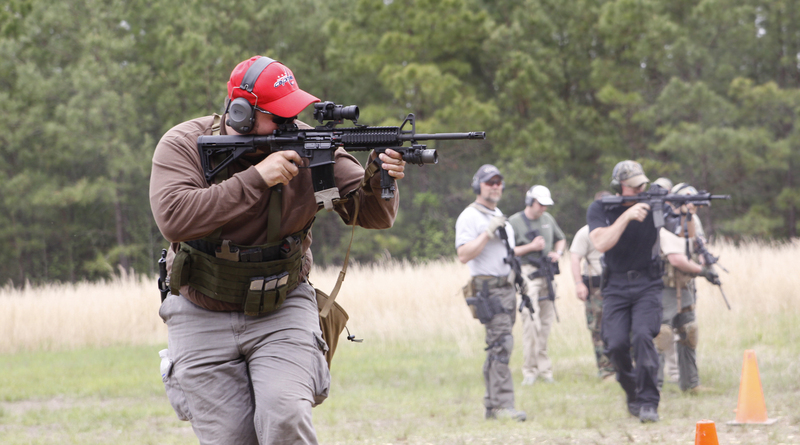 The class was VTAC’s three-day Carbine 1.5 offering. 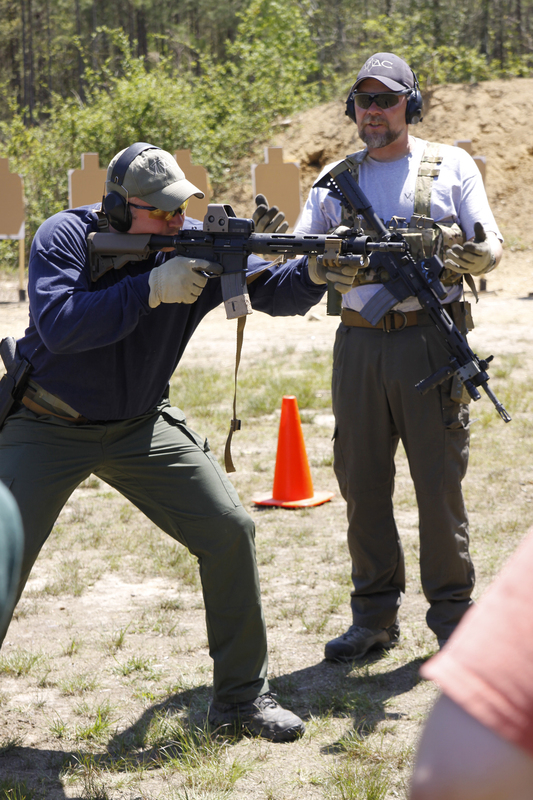 Lamb mentioned that the name was established tongue in cheek when numerous students and friends pointed out that the class goes significantly beyond topics that are generally covered in a three-day carbine course. 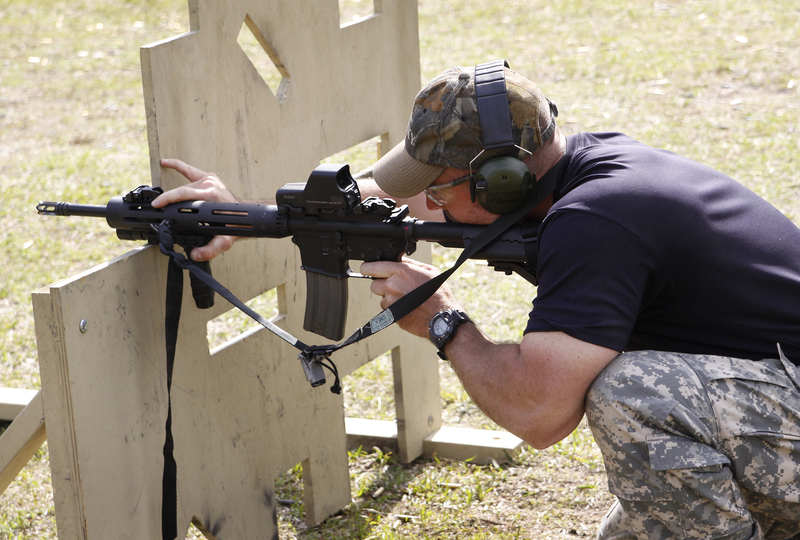 The 1.5 class requires students to have been through some credible manner of initial carbine instruction and is definitely geared toward the mission-oriented end user. The class homes in on several areas that Lamb feels are deficiencies across the rifle-carrying force: being able to hit from essentially any position while using the body and surroundings for support, understanding the cycle of operations and being able to clear malfunctions, being able to shoot effectively from the support side, and understanding maintenance and service life issues. There is an adage that perspective changes with location, and Lamb’s extensive real-world experience and time leading and training some of the best operational shooters in the world skew his expectation of what is basic to overlap what many in the business might view as advanced. This is reflected throughout the 1.5 course. There were 17 shooters enrolled in the 1.5 class. There was a healthy mix of SOF and conventional military, contractors, SWAT cops and dedicated practitioner-type citizens. The experience level was about as high as I have seen in a class, with most of the students having four or more carbine classes from the full spectrum of high-end instructors, none having less than two, and several with over a dozen military and civilian classes behind them. All were excited at the prospect of training with Kyle Lamb and came with great attitudes and open minds. Lamb felt the class was fairly representative of the types he gets in open enrollment classes. Kyle Lamb provides each shooter with personalized coaching tailored to his learning speed, experience, and mission. The gear in use down the line was interesting. There were, perhaps not surprisingly, a large percentage of VTAC rifles, with samples of each of the three available offerings from Smith & Wesson, JP Rifles, and Noveske Rifleworks. There were also two S&W 5.45mm rifles, both shooting old surplus ammo to help offset the scarcity and current cost of 5.56mm. This was the first class where I had seen shooters seriously trying to substitute the 5.45mm as a training gun, and both shooters ran the rifles well without any problems. Another anomaly in this class was the percentage of Noveske rifles. The Oregon-based semi-custom maker has quite a following in the hard-use world, but I had never seen more than a few in any one class, whereas there were six at this class. The balance of the class was rounded out by some recreational-grade carbines and parts guns, but due to their owners’ attentiveness and maintenance, they ran exceptionally well. There were only two major issues with any of the primaries, both in the “hobby” gun category. One slam fired when the firing pin froze in position, and the other’s new piston system bit the dust early on. Optics for the primaries were largely split between Aimpoints (13) and EOTechs (4), with magnified optics being used occasionally by two shooters. Three or four of the students used flip-up magnifiers for their red dot sights throughout the course, and the nature of the 1.5 class provided an excellent opportunity for them to determine their worth as a shooting aid. Support equipment for the primaries consisted of mostly VTAC slings with the odd single-point thrown in and a mix of chest rigs and belt-mounted pouches. Secondary weapons showed the strong inroads that the S&W M&P line has made into the service pistol market. The firing line was split down the middle, with half of the students and instructors carrying M&Ps while the other half shot Glocks, with one traditionalist holding out with his well-worn 1911. I personally used a Noveske VTAC mid-length 16-inch carbine with Aimpoint T1 in a LaRue tall mount (switching occasionally to a Leupold MR/T 2.5-8X in a LaRue SPR mount), with VTAC sling and P-MAGs. Secondary was a well-used M&P 9, with Black Hills ammo used for both weapons. The class was jumpstarted with a brief introduction, followed immediately by zeroing strings at 25, 50 and 100 yards. Lamb explained the pros and cons of the various zeros and made the point that, like throwing a football, it is more intuitive to aim higher as distance increases than to have to under-hold to allow for an overly high ordinate. The class then went into an inventory drill, with one minute to fire ten rounds from prone at 100 yards against a B8 repair center, the same sitting at 75, kneeling at 50 and standing at 25 yards. The drill revealed any gaps in the students’ ability to execute the fundamentals and also served to make practical corrections to the zero across multiple positions. Firing line sets up worst-case stoppages in their carbines. VTAC class went in-depth on malfunction causes, preventions, and reductions. The first half of Day One was all about fundamentals and was interspersed with all manner of tidbits that came up as they naturally occurred, from Lamb’s preference for loading 30 rounds into 30-round magazines—or to at least fill with an even number so that a tactile check always has the top round on the right—to how to translate a horizontal zero into a high-angle environment. After lunch, the emphasis shifted to being able to translate the execution of fundamentals into a strong fighting stance and deliver rapid shots to single and multiple targets. Kyle and his assistant instructor Dan used a combination of drills to gradually work the students up to the point where they were attempting to put ten shots into an IPSC A zone from 20, 10, and ultimately 5 yards against some very challenging par times. Stances that shooters could very effectively “hammer” from fell completely apart under these challenging ten-round strings, and students quickly got the message. During the failure drills, Lamb slipped in a suggestion that armored threats may be well serviced by an offset pelvis shot. Many have come to discount the once in vogue pelvis “mobility” shot, but often viewed through a pistol lens. Lamb relayed from first-hand experience the difficulty in stopping bleeding from close-range rifle impacts to the femoral artery, and offered that a shot to the groin or offset to the upper thigh could have meaningful effect from a carbine. Thinking back to mates who had nearly bled out from tiny shrapnel fragments to the same location made me appreciate the connection. Day One culminated in a scored drill to put controlled pairs into the A or C zone of three IPSC targets from five yards on the timer. Best times were under 1.5 seconds, while Kyle demonstrated it at a blazing 1.25. Day Two began with more work on target-to-target transition, this time adding more distance between targets to force shooters to drive the gun. Lamb quickly moved into turns and had the line working together and turning into and away from each other in short order. The next order of business was a master’s level treatise on malfunctions. With the class sitting in a loose school circle, Lamb went in detail through the cycle of operations and just about every conceivable interruption that could cause a stoppage or malfunction, along with the most efficient way to clear them. He placed great emphasis on truly understanding how the weapon operates, so that the shooter is not at the mercy of memorized responses or poorly matched solutions that worsen the problem. I gleaned a number of gold nuggets from this session, learning new and/or more efficient ways to deal with certain malfunctions. One such nugget was the recommendation to fill magazines halfway and then whack the bottom repeatedly to fault check if the feed lips would hold the maximum number of rounds. In suspect mags, the top rounds began to erupt out. Having the S&W Rifle Program manager, Matt Nyman, in the class was a bonus, as he was able to talk about the manufacturing side of certain parts and tolerances and how they affect reliability. The shooters next applied the instruction against some nasty stoppages, set up in groups of three random rifles under stress, and later went into setting them themselves and reducing them. The latter half of TD2 was dedicated to movement. The class went through a number of closing drills followed by a variety of lateral drills in both directions. Lamb had tips on how to refine the stability of the rifle without sacrificing speed and allowing recoil management. The shooters were quickly brought up to the point where they could move aggressively while delivering accurate fire. 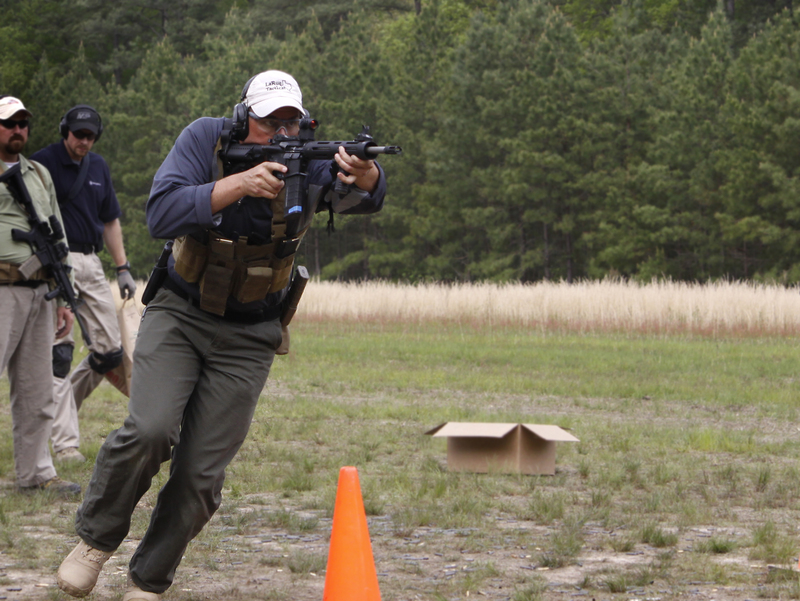 The second training day wrapped up with the ZigZag Drill—a drill popularized in Kyle’s book and videos on the VTAC site. The ZigZag combines turns, multiple shots, movement, multiple targets and laterals into one adrenaline-juiced 10-15 second ride. Each student ran it several times and for score, egged on by a relaxed sense of competition and the real requirement to perform on demand. VTAC barricade with nine challenging slots/ports is used to reinforce unconventional intermediate firing positions. VTAC’s Carbine 1.5 is defined by the third training day. The morning introduced the class to the support side transition, but not in the same way as many classes, where it is done by exception up close. 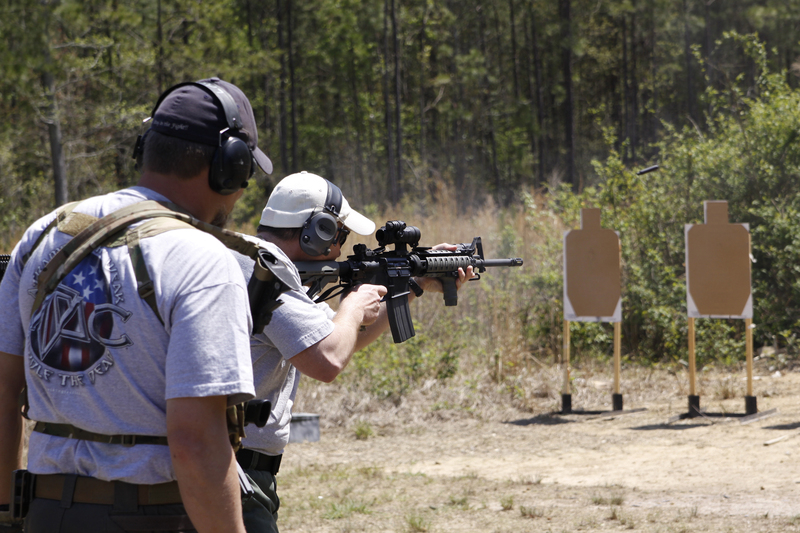 The shooters began at 50 yards engaging MGM/VTAC steel targets from stretch kneeling and “lunge stepping” into stretch kneeling from the support side. After a few awkward transitions, most of the shooters had forgotten that the transition was supposed to be difficult and were expeditiously getting good hits. This was followed by drills that had shooters switching shoulders on demand. The balance of the morning was spent on positions at 100 yards. Lamb walked the class through ten unique intermediate and prone variant positions. In each he briefed the applications and how to squeeze the most possible support for the weapon out of it, or how to quickly apply the position to cover or multiple targets. After each description, the shooters were encouraged to spend a few minutes working with the position from strong and support side and, if they were getting it, to try wounded shooter applications. Kyle and Dan worked the line as the shooters took turns working the positions on the steel targets, offering minor corrections and refinements. This was one of the more valuable aspects of the class, as each shooter learned new positions and creative ways to support the weapon. Upon introducing the VTAC barricade with its nine angled and slotted ports, the shooters hooked, braced, leveraged and wedged their rails, tubes or vertical foregrips in a wild variety of ways to get hits. Lamb demonstrated the real world value of a free float tube by demonstrating the impact shift between resting on the tube (none), resting on the barrel relaxed (slight), and bearing down on the barrel as under stress or while winded (severe). The class then ran a number of drills that combined support side transitions with the barricades under stress and a scored drill incorporating the new positions. The final drill of the day was a complex drill that rolled a little bit of everything into one exercise and was quite humbling. The shooters had to work multiple shoulder transitions in conjunction with the barricade against 50-yard steel, then hit multiple targets on the move to another barricade, where the steel was shot from both shoulders, and then support-side multiples shot laterally, followed by more from the original barricade. Barricade Kneeling position, with firing side knee raised to provide support, proved very effective. A number of things jump out as different with VTAC. Stylistically, their emphasis on running the collapsing stock out most or all of the way is decidedly different from many popular trainers’ recommendation. Over time I had gravitated to running about two clicks out, but found that when I ran it out the rest of the way, I was in fact better set up to run the drills presented in 1.5. Likewise, the VTAC forward hand position is stretched out pretty far, making for a decidedly bladed stance that very much resembles a good unarmed fighting stance. Lamb does not at all buy into the thinking that drives the squared-up stance that crowds the carbine in close. The emphasis on gaining support and stability for the weapon is something I haven’t seen emphasized anywhere nearly as much as Viking Tactics does. The VTAC (or similar two-point) sling was regularly used to shore up positions and ensure better hits and recovery, while any opportunity to monopod the rifle off of the magazine or vertical foregrip was encouraged. I mention this to reflect the time spent at 100 yards on smallish targets of 5.5, 8 or 12 inches, which is very unusual. At most carbine classes, the occasional “long” shot is 50 yards. Students quickly learned to use whatever was available to support the weapon at distance and brace off of the barricade while sandwiching the firing arm on the inside of a raised firing side knee. Even the less accurate shooters in the crowd quickly anchored steel with no drama. This emphasis on getting fast hits in the middle ground (neither close nor long range) has been a gap in many organizational training programs, which default to either close quarters or classic long range marksmanship. The VTAC Carbine 1.5 class simultaneously demands speed and accuracy. Lamb feels the human target is best represented by a tennis ball impaled through a section of rebar, and the accuracy standards used were significantly more demanding than many agencies’ eight-, ten-, or 12-inch vital zones. Most drills up close were expected to fall either within the width of an IPSC A zone (4 inches) or into a B8 center (5.5 inches), while there was pressure to make those zones fast without sacrificing a clean press of the trigger or aggressive, flexible stance. A small herd of sacred cows was slain throughout the course, ranging from minor points to major heresies in some circles. To spell some of them out here would risk losing the full context and learning points, but several articles could be spun from them. Lamb presented each without fanfare, dispassionately laying out why a commonly held point was invalid or to what degree and why. The class was very well run, with Lamb’s teaching style relaxed and almost casual, but with an immediate and easy command of the group. His method is the one sometimes called EDIP (Explain, Demonstrate, Imitate, Practice), where he steps forward of the line to describe the next skill, demonstrates it, has the students work through it under coaching, and then tests it with some sort of recorded drill. Questions were at all times welcome and encouraged. The class was moderately physical, and shooters needed to be in good shape to get the most out of the training. The third day in particular was a spectacular leg workout, with all of the ups and downs around the barricades that left reminders in my knees for several days afterwards. There were a total of eight drills fired for recorded score throughout the course, with each emphasizing to a different degree speed or accuracy while testing different technical skills. At the end of the class, the tally across all of the drills was counted and the high shooter received a gift certificate from S&W for a complimentary M&P .45, while the runner up received a deluxe VTAC rifle case from 5.11 Tactical. The training community is currently blessed with a selection of trainers who cover different specialties and applications. Viking Tactics is candid in stating that its classes are geared toward the serious end-user who wants to refine the fundamentals and perform at a higher level. 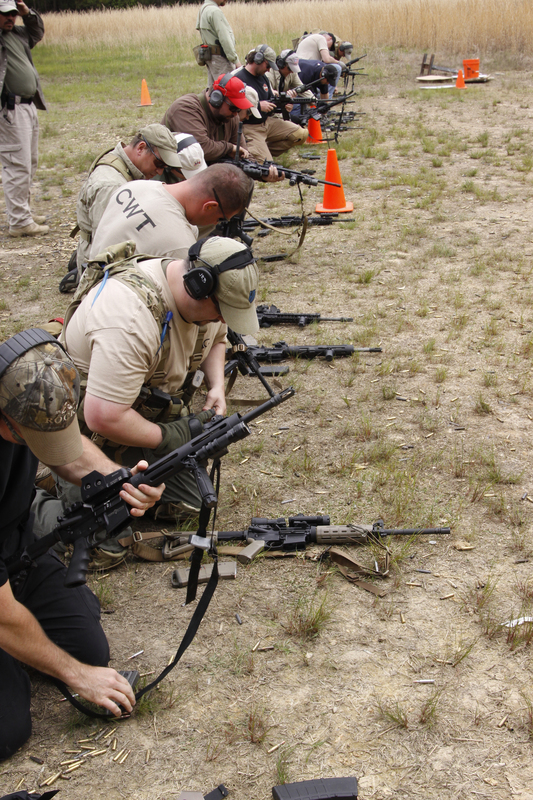 The wide variety of shooters in the Carbine 1.5 course left significantly more capable than when they had arrived, and all were enthusiastic about the training. I wholeheartedly recommend Viking Tactics’ Carbine 1.5 class to any experienced shooter able to get into one. And that’s the catch—space in VTAC’s few open enrollment classes is limited. Take my word that it’s worth doing some long-range planning to secure your spot.